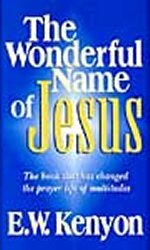 Description: This book is a thrilling exposition of the power and authority vested in the Name of Jesus,and the believer's right to use that Name. The book has changed the prayer life of multitudes. If you wish power in prayer, this book is a must. It will thrill and astound you, when you find out who you are in Christ, and what Christ is in you. Don't be a weak, defeated Christian, find out what the Word has to say about you, what your rights and privileges are as a believer. Although he was called Home to be with the Lord in 1948, the writings of Dr E W Kenyon, continue to thrill and excite and make the Word of God a living reality... no one that reads his books with an open mind can ever be the same again. They are a mighty unveiling of the Pauline Revelation, and are the basis for all the deeper life teaching and revival that is sweeping the world today.